Antique Blue 3 seater Chesterfield sofa | Handmade by the team at S.W. James & Co. Perfect for any room size. Our No.1 3 seater Chesterfield sofa in blue is perfect when entertaining friends. We think it is a truly stunning piece of furniture and it certainly makes a statement in any room it lives in. 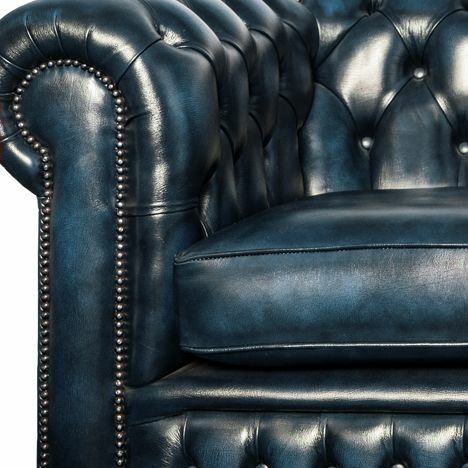 Our 3 seater No.1 antique blue Chesterfield sofa is still handmade by the team today, as it was originally. When covered in our blue antique rub leather each item we make takes on a character all of its own. Once finished a top coat of darker blue dye is carefully polished in selected areas to expose the lighter shade beneath. The result achieved is a beautifully aged looking, 3 seater blue antique Chesterfield. Our 3 seater No.1 is an increasingly popular choice for home owners seeking the classical and timeless style that a British chesterfield brings. 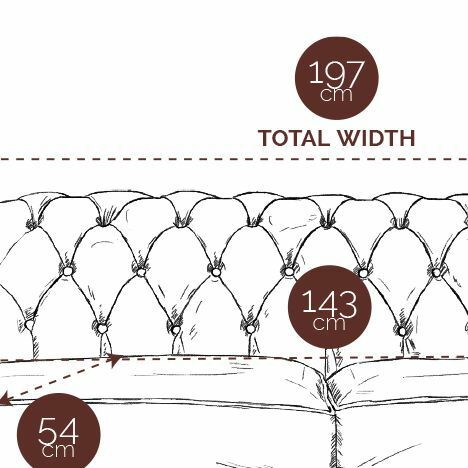 Our 20mm machine scribed leather/wool coated buttons are tufted by hand in the typical 6 inch diamond layout common to chesterfields and provide wonderful highlights and shadows to its surface regardless of the upholstery choice.